US foreign policy expert Zbigniew Brzezinski says the United States should retaliate if Russia does not stop bombing its assets in Syria. 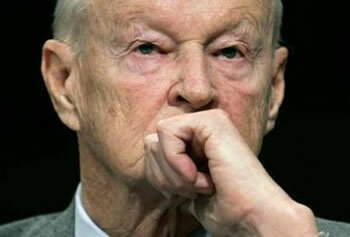 Brzezinski, the national security adviser for former President Jimmy Carter, advised President Barack Obama to attempt to disarm the Russians if they keep attacking the CIA-trained militants in Syria. “But, better still, Russia might be persuaded to act with the US in seeking a wider accommodation to a regional problem that transcends the interests of a single state,” he added. A new US intelligence assessment has found Russia has targeted militant groups backed by the Central Intelligence Agency (CIA) in Syria. The assessment, shared by commanders on the ground, has led American officials to conclude that Russian warplanes have intentionally struck CIA-backed militants in a string of attacks running for days, the Wall Street Journal reported. Moscow’s apparent decision to strike CIA’s militants “at best” reflects “Russian military incompetence,” and worst, “evidence of a dangerous desire to highlight American political impotence,” wrote Brzezinski. He added that if Moscow continues to target these people, then Washington should retaliate against Russians. “In these rapidly unfolding circumstances the US has only one real option if it is to protect its wider stakes in the region: to convey to Moscow the demand that it cease and desist from military actions that directly affect American assets,” he said. Obama administration officials are debating how the United States can come to the aid of its proxy forces on the ground without risking a broader conflict, according to the Wall Street Journal. US officials said Russia’s moves in Syria posed a direct challenge to the Obama administration’s foreign policy on the Middle East. Moscow’s commitment to the Syrian government runs counter to current US policy, which calls for the ouster of Syrian President Bashar al-Assad. Russia has been beefing up its military presence in neighboring Syria, deploying warplanes, tanks and personnel to an airfield in the western port city of Latakia. It launched a coordinated air campaign to fight Daesh (ISIL) and other terrorists. Senior Russian officials have said the current campaign is limited to airstrikes, but have not ruled out “volunteers” on the ground. Syria has been gripped by a foreign-backed militancy since March 2011 aimed at toppling the Assad government. The violence has claimed the lives of more than 250,000 people so far.